Having recently watched the latest Transformers movie in theatre – perhaps against my better judgement – I’ve been thinking a lot recently about the character Optimus Prime. Because the movie, in my humble opinion, made his personality almost completely unrecognizable. Optimus Prime – right up there with Xena, the Warrior Princess – has long been a favourite character of mine. For those unfamiliar with the Transformers franchise – of which there have numerous incarnations via cartoons, movies, and comics – the main, unchanging premise is that of a race of giant alien sentient robots who are gripped in an eons-long war of good against evil. Optimus Prime is the long-standing leader of the heroic Autobots against the ruthless Decepticons led by the tyrant Megatron. 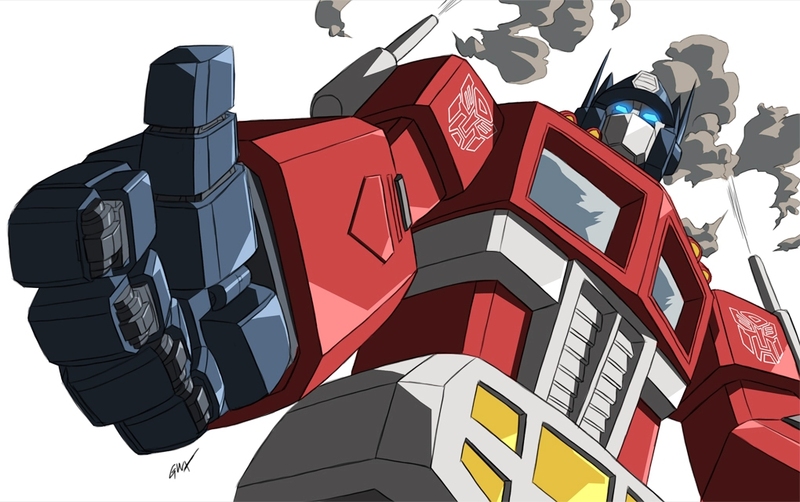 Having begun his life as a civilian (in some continuities a dock worker, in others, a file clerk), Optimus Prime’s authority to lead comes from his inherent goodness having led to his choosing by a legendary talisman (in some continuities a religious one, in others, a religious sentient one) called the Matrix of Leadership, which subsequently became incorporated into his body. He is usually portrayed to be as physically imposing as he is noble, brave, and self-sacrificing. His catch phrase (aside from the ever-rousing “Transform and roll out!”) is Freedom is the right of all sentient beings. I first got into Transformers at age six. I had a babysitter who had three sons around my age, so all of us would play together. They introduced me to all of the popular “boys toys” of the 80s – Transformers, G.I. Joe, Voltron, dinky cars, and Spider-Man to name a few. We would play with their various Transformers action figures and watch the cartoon. At that time, Optimus Prime was my favourite because he was the cool dude in charge – the big bot with the big gun and bold colour scheme and unmistakable, authoritative voice. Then I grew up and forgot about him. It wasn’t until many years later when I happened to catch the first live-action Transformers movie on TV that I recalled I’d once been a fan. I hadn’t even known the movie (and by then, it’s sequel) existed, for I’d been working in the national parks, living in the wilderness unplugged from most of pop culture. I proceeded to devour all three live-action movies in rapid succession, followed by two different reboot cartoon series (Transformers: Prime and Transformers: Animated). The cartoons did a much better job of exploring the subtleties of Optimus Prime’s character – of the humanity, as it were, behind the heroism. When I look at Optimus Prime now, I see someone whose bright red shoulders are so broad, not to trounce his adversaries, but to better support the weight of the world that they carry: leadership in an endless war, its attendant deaths and displacement of countless citizens from a damaged home planet, and the transfer said war to an inhabited alien world (i.e. Earth). For many kids of the 80s, Optimus Prime was the first exposure we had to a heroic ideal. He’s the leader a lot of us have always wanted, but perhaps doubt can truly exist in the real world. He’s the type of hero I’d want to be, but fear I never could, for the responsibility of living by such demanding morals and ethics just seems utterly exhausting. I recently learned of the concept of “character alignment”. 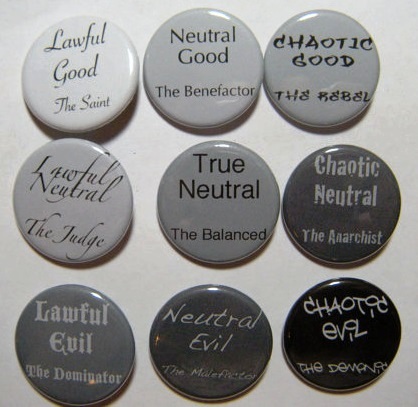 This comes from the Dungeons & Dragons community, and is a means of classifying a character’s relative goodness vs. evil and his/her penchant for lawfulness or chaos. A Lawful Good character typically acts with compassion, and always with honor and a sense of duty…. Lawful Good characters … may sometimes find themselves faced with the dilemma of whether to obey law or good when the two conflict — for example, upholding a sworn oath when it would lead innocents to come to harm…. Reading this immediately made me think of Optimus Prime, and how the most interesting conflict for a Lawful Good character arises from such a dilemma as described above. Or perhaps a choice between the needs of the many and the needs of a few who are particularly special to the character. A Lawful Good character probably has many followers or hangers-on who bask in his/her benevolence, but not that many friends able to walk alongside the path of the unwaveringly straight and narrow, so such a scenario would be all the more tragic. A Lawful Good character is all about the struggle to do what’s right, not what’s easiest or what satisfies us baser creatures in a moment of anger; that and helping others find the conviction to also do the right thing. A Lawful Good character is not to sort to say “Well screw them!”when comrades no longer want to cooperate. The key as I see it to working authentically with a character like Optimus Prime isn’t to nudge him away from his native character alignment (as I see occurring more and more in the live-action movies, the most recent one most notably). A better way is through a flat character arc – an arc in which, rather than the character undergoing change from the influence of the world around him/her, the world is what ends up changing as a result of the character’s efforts and influence. Making the world a better place is the very thing, after all, that Optimus Prime is fighting for. A/N: Although I dislike many aspects of the live-action Transformers movies, one thing I absolutely adore is the scores by composer Steve Jablonsky. This track from the first movie – entitled “Optimus” – captures both the strength and vulnerability of its eponymous subject perfectly. What childhood cartoon character are you still fond of today? What traits does s/he idealize for you? Let me know in the comments. This entry was posted in Character Study and tagged Cartoons, Character alignment, Character arc, Characters, Movies, Optimus Prime, Transformers, TV. Bookmark the permalink. Thanks for linking to my post on flat character arcs! I’m glad you enjoyed it. Good thoughts here. And I agree: the Transformers score is about a jillion times better than the movies. I wasn’t familiar with the flat character arc before I read about it on your blog. Now, I’m excited by all the storytelling possibilities it presents; who wouldn’t want to be the one to help change the world? Most of my cartoon viewing as a child was of the comic variety.. Bugs Bunny, for example. I did admire Bug’s wit. I ‘flew” around the house as Superman and stomped around as Godzilla, but the character whose traits resonated with me was Captain Kirk from (duh) Star Trek. He showed bravery and confidence as well as a willingness to take risks, and he didn’t give up in the face of towering odds. Lots of factors play into success that are beyond one’s control, but determination is something you can own yourself. I watched Bugs Bunny as well – I’m convinced that was the birth of my interest in classical music. I sometimes wonder what sort of different person I would be had I not had that babysitter with the three sons. They truly opened an entirely different world to me – the world of boys’ play – from which I developed a much more balanced set of interests that continue to motivate me to this day.